The Department of Zoology and Botany of V.V.Sangha’s Smt.A.S.M. 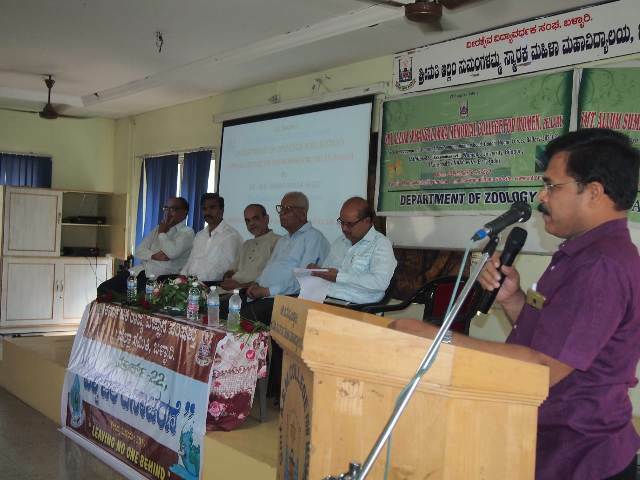 College for Women, Ballari, had jointly organised a special talk on the topic “ENVIRONMENTAL ISSUES” with the special reference to Deforestation on 22nd March 2019 in the College Seminar hall. The renowned environmentalist, the founder of Appiko Movement and social activist Dr. M. R. PANDURANGA HEGDE who was the chief guest and also the resource person spoke on the topic. He addressed the ‘Chipko Movement’ and ‘Appiko Movement’ in Western Ghats for saving trees to preserve natural habitat to support life in forest. He said life is impossible without air, water and soil. He emphasized role of forest habitat providing good air, water and fertile soil for survival of life. He also saiddue to pollution, exploitation of forest resources, erosion of soil layer duecutting of trees,contamination of river watersand other developmental activities like railway tracking, highway expansion and other factors have possessed a high negative impact on theWestern Ghats one of the world biodiversity hotspot. Today gradual decrease in the forest habitat, effects on many indigenous Flora and Fauna of Western Ghats. He highlighted the point that the natural resources belong to the societyand every human is bound to practice the maxim “Ulisu, Belasu, Balasu”. These resources cannot be produced by man. Therefore, all of us should make use of natural resources in a proper way without any greed. He explained the role of honey bees as pollinator and spoke how they have involved in their conservation. He also signified the statement “Malenadina Hasiru, Bayaluseemeyausiru”. Which means Deccan Plateau is entirely depend on Malanadu for Oxygen and other natural resources. Dr. S.Y.Thimmareddy, Principal, Smt.A.S.M. College for Women, Ballari, made presidential remarks. Mr.Satish Dupam and Dr.M.G.Nadagouda, Head of Department Zoology and Botany respectively are also spoke on this occasion.